The digital design for a rose window was produced through an innovative PhD project and then shown as a digital projection. 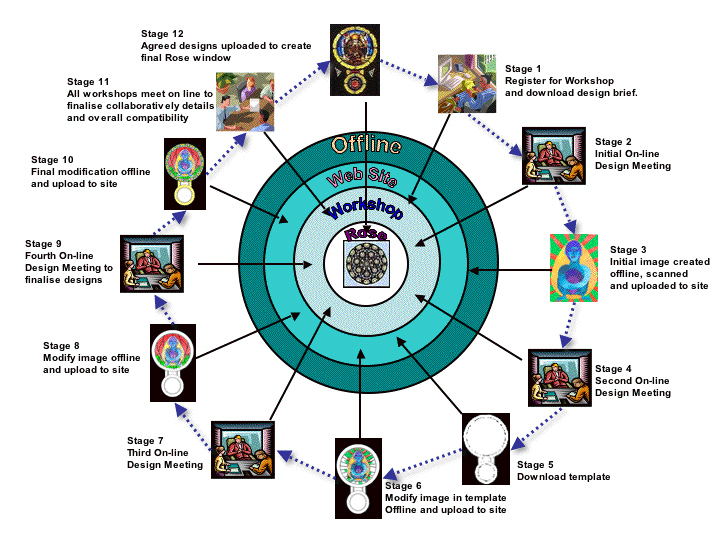 As a community based artwork it reconfigures traditional stained glass into a modern multi-cultural context using digital graphics. The rose window celebrating images of female figures measures 45 feet diameter when full scale. It was compiled by 17 women artists collaborating and negotiating on line over the Internet in the course of a 4 month pilot project in the summer of 2006. The aim of the research was to investigate the potential of the Internet to create a large-scale independent artwork from individual contributions by a group of artists communicating long distance online. 1. The original design was made is based on the geometry of seven – a number commonly associated with the feminine in many religious traditions. It has 28 major figurative panels with the Cosmic Egg, the 29th, as the central image. There are three expanding circles of figurative panels for images. 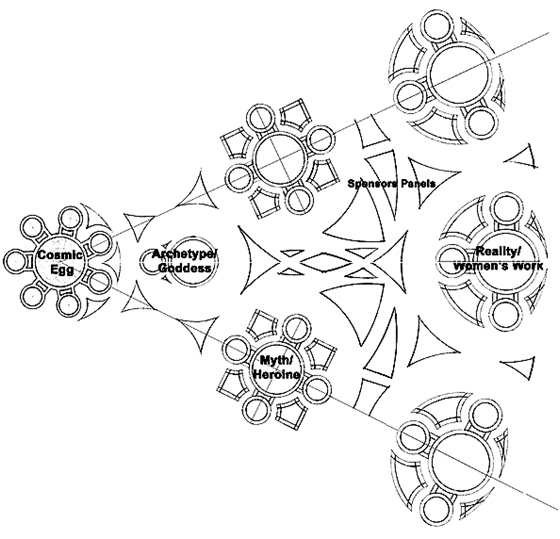 The inner circle made up of seven Archetypal (goddess) figures. 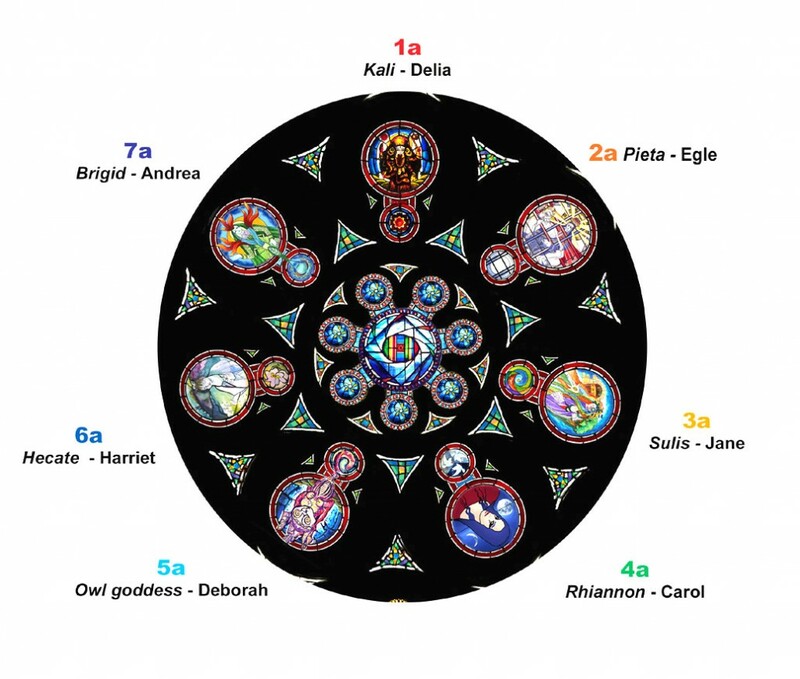 Seven Heroines (mythical and real) in the middle circle. The fourteen panels around the outer edge display the variety of Women’s Work in the world. The artists used these shapes as the template for their design. 2. A website was set up giving advice on how to make the designs and information about the stylisation based on the early medieval model. In some cases classes were held on how to use simple colour collages as a basis for the final design. Artists did not have to be skilled in digital design work although some of them were proficient in Photoshop. 3. Working in their preferred medium, the artists made initial designs and scanned or photographed them to send to the project. Painting, collage and digital graphics were all used very successfully. The artists worked in small groups of seven and met about four times on line to discuss their images and make adjustments so that they harmonised together. This involved agreeing on sizes, colours of backgrounds and general appearance. 4. Delia as editor/curator compiled the designs into the overall pattern so the artists could judge how well they looked together. Eventually panels were agreed upon in each group and then the final window was compiled.